When selecting a new pet for your family, there are a number of different options available, but we believe visiting a shelter or rescue organisation is a great place to start your search. When you rescue a pet, not only will you be giving a beautiful animal a second chance at a happy life, but the shelter or rescue organisation will also have a number of different breeds available, (including pure-breds in many cases,) as well as pets at all different stages of life, not just kittens and puppies. This means that the shelter or rescue organisation will be able to work with you to select the perfect pet to suit your family and lifestyle. But why are we so passionate about adopting a rescue animal? It’s always been a cause close to our hearts, but became all the more important when we met our Animal Ambassador, Sahara. 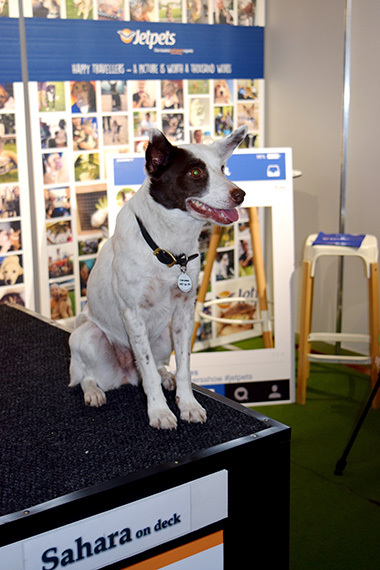 Sahara is an amazing little Koolie Kelpie Cross that was saved from death row by Victorian Dog Rescue. She was found abandoned and mistreated, wandering around the bush in Mildura in country Victoria. Without a home to go to, she was taken to the pound. The day before she was due to be put down, she was rescued and has since lived with Jetpets Pet Handler, Dave Higgins just outside of Melbourne. As soon as we met Sahara, we fell in love and knew we had to join with her and Dave in raising awareness for rescue animals. In December 2012, Sahara travelled around Australia doing just that, on her ‘Tour de Woof’ which you can view here. Here at Jetpets, we have strong partnerships with many rescue organisations (including the wonderful team at Australian Working Dog Rescue) and happily help facilitate the transport of these amazing animals to their ‘fur-ever’ homes wherever we can. In fact, one of our recent rescue moves was a little brother for Sahara, Jet a rescue puppy from AWDRI. Have you adopted a rescue pet? Share your stories with us on Facebook.